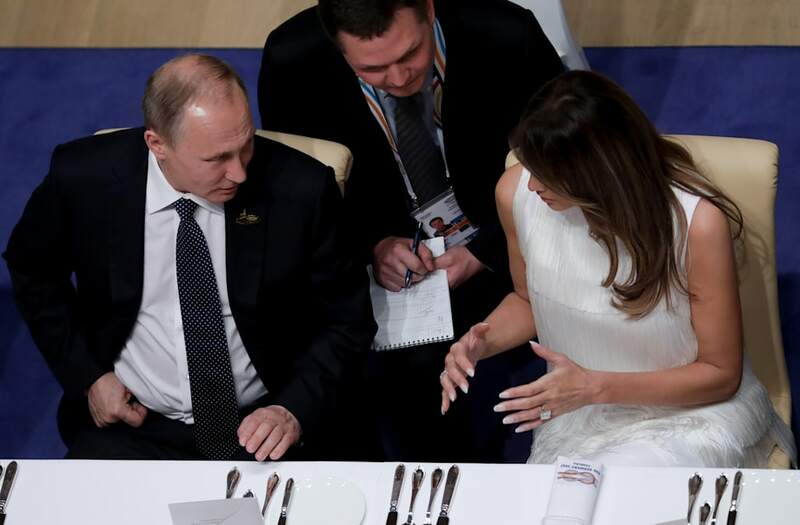 First lady Melania Trump sat with Russian President Vladimir Putin at a G-20 banquet last weekend, and details of their conversation have now been made public. Putin's press secretary Dimitry Peskov reportedly spoke on the pair's conversation during a Russian television interview, saying Putin "remained satisfied" with the exchange, that included a dialogue around the G-20 summit's agenda. "I think there was certain sympathy," Peskov said. He added that the Slovenian native model and Russian foreign leader discussed working sessions on gender equality and the economic role of women. Russian President Vladimir Putin (R) shakes hands with U.S. First Lady Melania Trump during a meeting on the sidelines of the G20 summit in Hamburg, Germany July 7, 2017 Sputnik/Mikhail Klimentyev/Kremlin via REUTERS ATTENTION EDITORS - THIS IMAGE WAS PROVIDED BY A THIRD PARTY. EDITORIAL USE ONLY. President Trump met with Putin for an initial face-to-face exchange at the G-20 summit in Hamburg last week, where they reportedly discussed Syria, Ukraine and cyber security. Trump, though, backtracked on cyber security with a Sunday tweet, saying "The fact that President Putin and I discussed a Cyber Security unit doesn't mean I think it can happen." After the originally scheduled 30-minute meeting between the two world leaders ran over, Melania was sent in to try and wrap up the conversation. The entire meeting ended up running over 2 hours long. The first lady was at one point trapped inside a Hamburg hotel during the presidential couple's visit to Germany, unable to leave due to violent protests taking part throughout the city.